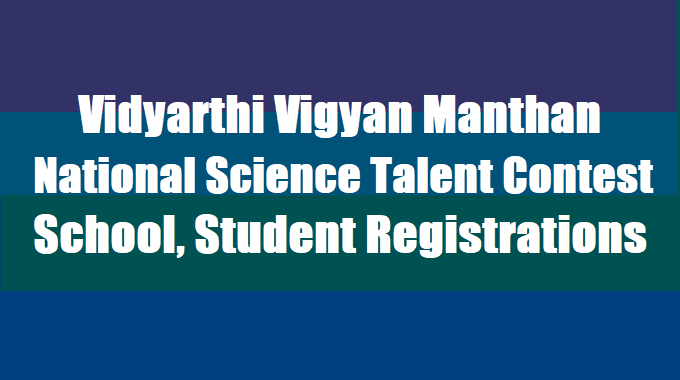 VVM: Vidyarthi Vigyan Manthan (VVM) is a national program for educating and popularizing science among school students of VI to XI standards. VVM also endeavours to identify the bright minds among the student community, who are keen on subjects related to science. Vidyarthi Vigyan Manthan (VVM) is initiated by Vijnana Bharati (VIBHA) in collaboration with Vigyan Prasar, an autonomous organization under the Department of Science and Technology, Government of India and National Council of Education Research and Training (NCERT) an institution under the Ministry of Human Resource Development, Govt. of India. Vidyarthi Vigyan Manthan (VVM) is an initiation of Vijnana Bharati (VIBHA), in collaboration with National Council of Education Research and Training, an institution under the Ministry of Human Resources and Development and Vigyan Prasar, an autonomous organization under the Department of Science and Technology, Government of India. VVM is a National program for educating and popularizing science among school students of VI to XI standards. VVM aims to identify and nurture the bright minds among the student community, who are keen on subjects related to science. To conduct an annual talent search exam at the national level to identify students who have a scientific bent of mind. To provide the winning students with mentors to enrich science learning experience to carry forward their science education at higher levels. To organise exposure visits for the winners to various R&D institutions in the country. To identify successful students at the State and National levels and felicitate them with prizes and certificates. To create interest among students in science. To educate school children about India’s contributions to the world of science and technology, both traditional and modern. To provide hands-on training to students through workshops and other events. Enter the details of the school like school name, school address, GEO Mapping of school, UDIES code of school,name of principal, name of exam coordinator, mobile number, email ID etc. This information will be shown as school profile on VVM portal. The entered data will be verified by VVM admin through sending one-time password (OTP) and an Email verification link on registered mobile and Email respectively. UDIES code will be used as school identification number. The exam coordinator can now register students who wish to take up the VVM online exam. Schools can register students one by one online or can download editable excel format (available on portal for offline data entry) to upload. This information will be shown as student profile on VVM portal. In case of offline completion of the entries the data can be uploaded online. Exam coordinator is authorized for modification of student’s information (if required). After successful submission & payment an OTP and email will be sent to the registered mobile number and email ID of each registered student. The student should click the verification link and complete the verification process by entering the OTP. After successful verification, the student will be automatically redirected to the student profile page. The student must specify the details of the device to under take the exam. In the student profile page, the details of the student like profile photo needs to be uploaded (mandatory) by the student using App. On confirmation of device details and completing the profile information the student registration process is complete. Student can modify the details of device up to 72 Hrs prior to exam. From the school login, the details of all the students registered from that school will be displayed. The authority of modification in the student’s name, student’s mobile number etc. will only be with the school coordinator. To conduct the examination, School should provide classrooms and invigilators. 20% of total registered amount collected from the school will be kept by them and the balance 80% should be transferred to VVM Delhi office through RTGS/NEFT. Once the registration process is complete the Exam App will be made available for download from the profile page of the student. The App will be downloaded only on the registered device (laptop/tablet/mobile). Depending on the type of the registered device (Android/iOS/laptop) the corresponding application will be downloaded to the client device from vvm.org.in. The profile page will contain detailed instructions for App download and installation. Request support link will be available in case of any issues along with help line number. To build the confidence of the students and to make exam user friendly, sample mock test will be made available regularly. The registered students will get regular notifications regarding the activities. The student profile will be displayed in the top section of the App. The profile will contain student details with photo for identification. On completion of the mock test, the student can view the results of mock test in his/her profile page. After verification of the answers,student can report to our admin support if he/she faces any problems. 16 November 2018 onwards, the student will receive an SMS and Email notification to download the latest App. This download must be done during16-23 November, 2018. After 23 November 2018, the app will not be available for download. Once downloaded, the student should click on the verification link, to make sure that the latest version of the App is downloaded and is running on the registered device. 'The student will not be able to appear for the exam without the latest updated App installed in the registered device.' Registration will be available only through Online Registration which can be done through the website www.vvm.org.in. English, Hindi, Malyalam, Tamil, Kannada, Telugu, Marathi, Gujarati, Odia, Bengali and Punjabi. Top 20 rankers per class per state will be identified to participate in the one or two days State Level Camp (SLC). Winners will have to attend the State Camp with their own travel expenses. The camp will be organised anywhere within the state. The venue and other details will be informed to all selected students. State Level Camp will consist of Application Oriented Multiple Choice Questions, Hands-On Activities, Observation and Analysis, Situational Problem Solving Ability and a series of other activities. States will be clubbed according to number of students appeared for the examination with the consideration of their geographical and cultural resemblance and convenience for the students. From each State Camp, top two students from each class i.e. total 12 students per state, will be invited to a two-day National Camp. National Camp (NC) will comprise Presentations, Scientific Understanding, Innovation and Creativity, Out of Box Activities, & Assessment of Leadership Quality.